Two Onslaught albums? Yep. But this incarnation feels like a different band entirely! Quite possibly the finest commercial thrash album ever prouced by a UK band, Onslaught were aiming for worldwide recognition when they released this melodic thrash masterclass at the tail end of the 80’s and it should have led to greater things. Unfortunately, all In Search Of Sanity achieved was splitting existing fans straight down the middle and it would take 18 long years for Onslaught to bounce back. And bounce back they did, with the overwhelmingly aggressive modern thrash classic that was 2007’s Killing Peace….but we’ve covered that already! 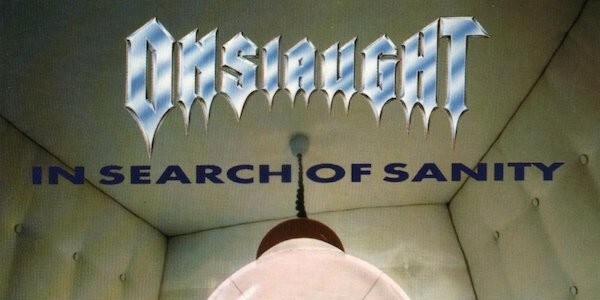 In Search Of Sanity saw Onslaught swap the gravel-throated vocals of Sy Keeler (now thankfully back in the fold) for the almighty power of Grim Reaper’s Steve Grimmett, transforming Onslaught from punk/thrash extremists overnight to an altogether more clinical and commercialised melodic thrash machine. However, while In Search Of Sanity may have been more Metal Church (circa Mike Howe’s original tenure) than Slayer – and cleaner than a nun’s saintly undercarriage in the process – its go-for-broke mentality must be applauded; thrash was huge in ’89 and Onslaught shouldn’t have had to apologise for wanting their own large slice of the thrash pie. Onslaught, as you already know, are stronger than ever and Steve Grimmett recently bounced back from horrific health problems and is back up on stage, where he belongs, singing better than ever! Liked that? Try this: With screecher Sy Keeler back in the fold, Onslaught returned to the sound of old and Killing Peace (2007), Sounds Of Violence (2011) and VI (2013) are all are hard-as-nails and stand proud as three of modern thrash metal’s finest recordings!